Is This What The US Really Wants From Russia? The US’ recent multidimensional asymmetric offensive against all manner of Russian interests isn’t the random symptom of psychotic Russophobia that it’s being presented as, but is part of a comprehensive strategy for pressuring Moscow to abandon its close cooperation with China & Iran in exchange for a “New Détente”, a scenario that shouldn’t be ruled out if Trump gets his way during the upcoming meeting with President Putin. Many people are struggling to find any rhyme or reason behind the US’ anti-Russian moves over the past couple of years, especially the ones that Trump was supposedly forced into by the “deep state” out of the mistaken belief that it would relieve the fake news-driven Russiagate pressure on his administration, but the answer to it all is a lot simpler than it appears. The fact of the matter is that everything that’s happening is intentional and part of a comprehensive strategy for getting Russia to abandon its close cooperation with China & Iran in response to the US’ multidimensional asymmetric offensive against its interests, although it’s proven itself to be a failed plan that requires urgent reform. Whether it’s the West’s “Russian propaganda” witch hunt or the Skripal chemical weapons false flag scandal, every single anti-Russian move that’s been undertaken in the last few years is designed to advance this objective. There was credible speculation right after Trump’s 2016 victory that his administration would try to split the Russian-Chinese-Iranian multipolar triangle in Eurasia, and that’s exactly what the President and his team are trying to do, albeit in a different fashion than what people might have expected. Trump rightly calculated that Obama’s unprecedented outreach to Iran through the 2015 nuclear deal was being taken advantage of by Tehran and that the Islamic Republic never had any serious intentions in agreeing to the tacit quid-pro-quo being offered at the time to replace Saudi Arabia as America’s preferred regional partner. Accordingly, he decided to pivot away from his predecessor’s policy and use nothing but “muscular means” to coerce Iran into submitting to the US’ military might, which is a work in progress and one that will certainly be made all the more difficult by Tehran’s mastery of asymmetrical responses. As for China, Trump also learned from the mistake of his predecessor who at one time offered the People’s Republic a global partnership through the so-called “G-2” or “Chimerica” concept but was rebuffed by a Beijing that’s both too proud to share world leadership with America and also reluctant into being tricked to take on responsibilities that it didn’t agree to or anticipate at the time. It wasn’t coincidental that the G-2’s failure was soon thereafter followed up by China’s announcement of its One Belt One Road (OBOR) global vision of New Silk Road connectivity in order to economically reform the structural basis for the “Washington Conesus” and consequently facilitate the emerging Multipolar World Order. Trump’s Kraken-like answer to this challenge was to continue with Obama’s Hybrid War policy in targeting the most vulnerable “Global South” transit states for China’s transnational infrastructure megaprojects simultaneously with the commencement of a trade war against the People’s Republic. Iran’s full-blown ideological resistance to striking a “deal with the devil” and China’s unflinching commitment to challenging the US’ unipolar dominance of the world mean that there’s no realistic chance that either of them will budge from their previous refusals to abandon the other in exchange for an alleviation of American pressure on their countries, thereby pointing Trump in Russia’s direction because he considers it to be the “weakest link” in this multipolar arrangement. After all, Russia has always insisted with total sincerity that it wants nothing more than an equal relationship with what it still continues to call its “Western partners”, which logically entails them respecting the country’s so-called “sphere of influence” in the former Soviet space. Previous US administrations smacked away Russia’s olive branch every time it was offered, but Trump seemed to actually be interested in cutting a deal with Moscow before the “deep state” intervened to stop him. Ironically, that move might go down in history as the last possible chance that the US had to realistically bring Russia back into the “Washington Consensus” by peaceful means, as Moscow signaled that it was prepared to enter into a so-called “New Détente” with Washington that would have obviously involved mutual “concessions/compromises”. That “lost opportunity” might never be regained because Russia’s resolve has since hardened after feeling betrayed by Trump and subject to his administration’s humiliating punishments for not submitting to America without any preconditions (“mutual concessions/compromises”), which is what the “deep state” wanted after making the massive error of judgement in convincing themselves through “groupthink” that President Putin would follow in Yeltsin’s footsteps and surrender if the powerful “oligarchic” class put enough pressure on him to do so in exchange for lifting the sanctions. That ship has sailed and what’s happening now is a combination of scorn and strategy. The US will never forgive President Putin for refusing to bow down to the Obama-era liberal-globalist “deep state” that sabotaged Trump’s outreach plan, which is why it’s getting so nasty in carrying out witch hunts against Russian media and expelling the country’s diplomats on unproven pretexts. For the “deep state”, this is “personal”, though while Trump seems to understand the “effectiveness” of “playing dirty” as a form of psychological warfare against the Russian leadership, he’s never publicly swayed from his campaign pledge to cut a deal with Russia if it was possible (i.e. the “deep state” lets him or he goes around their backs). It’s with this backdrop in mind that Trump invited President Putin to the White House for a forthcoming meeting that will presumably be about “ironing out their differences” and advancing the presumably mutual goal of a so-called “New Détente”, albeit not on the one-sided unconditional terms that the “deep state” is obsessed with. Trump realized that Russia is digging in its heels by deepening its partnerships with China and Iran in response to the “deep state’s” multidimensional asymmetric aggression and that this policy has been nothing but counterproductive to America’s predominant New Cold War interest in “containing” China. Furthermore, the President seems to have convinced the “patriotic” and “pragmatic” elements of the “deep state” that this is the case and that it’s impossible for America to make any tangible progress in stopping the Silk Road if it has to multitask between “containing” China, Iran, and Russia in vastly different theaters and with completely different methods. It’s much better, the billionaire businessman likely reckoned, to walk back some of his administration’s unnecessarily aggressive moves in Europe and perhaps elsewhere as part of his country’s “mutual concessions/compromises” with Russia for a “New Détente” than to continue with this completely failed policy of pressure. What the US wants from Russia in exchange is simple, and it’s that it expects Moscow to scale back its strategic partnerships with Tehran & Beijing and to not interfere with Washington’s “containment” campaigns against both of them. Russia is already passively allowing the US and its allies to “contain” Iran in Syria out of self-interested prudence in preventing World War III, but it has yet to pull back from its Silk Road relationship with China. It’s unclear exactly how the US envisions Russia doing this in a “plausibly deniable” way that mirrors the Iranian approach and avoids provoking a hostile reaction from China, but whatever it is that Washington has in mind, it hopes that Moscow will agree to it so that President Putin can forget about international drama and completely focus on fulfilling the comprehensive domestic reform agenda that he plans to carry out during his fourth and final term. It’s impossible to speculate on whether Russia is even interested in such a scenario at this point in time given all that’s transpired between it and the West in the past year alone, but playing “devil’s advocate” for a moment, there might be another enticing reason aside from the domestic one why Moscow might decide to “play ball”. The increasing polarization of the world economic system into globalization-spreading China and protectionist-espousing America is broadly returning International Relations to its Old Cold War-era bipolarity in advance of its eventual transition to multipolarity, and it’s here where Russia could play a pivotal role in leading a new Non-Aligned Movement (Neo-NAM) that helps other countries “balance” their relations with both superpowers. The US might begrudgingly be forced under the current circumstances and the objective limits of its power to accept the relative curtailment of its influence over some countries by Russia so long as Moscow fulfills a similar role vis-à-vis them and China. It’s a risky gamble because a Russian-led Neo-NAM could just as easily tilt the strategic balance of global influence in the New Cold War towards China as it could towards America, but Washington is wagering that Moscow might conclude that its self-interest could best be protected by maintaining “harmony” between the two superpowers in Eurasia, thus enabling the US to focus more on destabilizing the Silk Road through Hybrid Wars in Africa and the parts of the supercontinent not covered by this “balancing bloc”. Russia’s low-cost but high-impact “balancing” investments could yield enormous dividends for its influence, while any prospective de-escalation in Europe due to the “New Détente” would free up the country’s resources to focus more on carrying out President Putin’s ambitious domestic reform agenda and delivering on the campaign promises that he made his countrymen in order to sustainably guarantee his legacy. To reiterate what was just written, there is no way to know for certain whether the US’ latest gambit in trying to reach a “New Détente” with Russia will succeed or not, but it needs to be recognized that the multidimensional asymmetric aggressions that it’s waged against its rival’s interests will eventually take their financial toll and that President Putin might find it increasingly challenging to execute his comprehensive reform agenda on the home front unless he cuts some kind of deal. This doesn’t imply that Russia is at risk of “selling out” to the US, but just that President Putin is accountable first and foremost to his people and then only secondly to his country’s international partners. If the Kremlin concludes that Russia’s interests would best be advanced through engaging in a series of “mutual concessions/compromises” with the US as part of a “New Détente”, then it won’t hesitate to make that move; likewise, if the savvy Russian leader recognizes that he’s being “taken for a ride” by Trump and that his “counterpart” is offering him a lopsided deal that’s doomed to make his country America’s “junior partner” in Eurasia, then he won’t think twice about walking away with no “deal”. 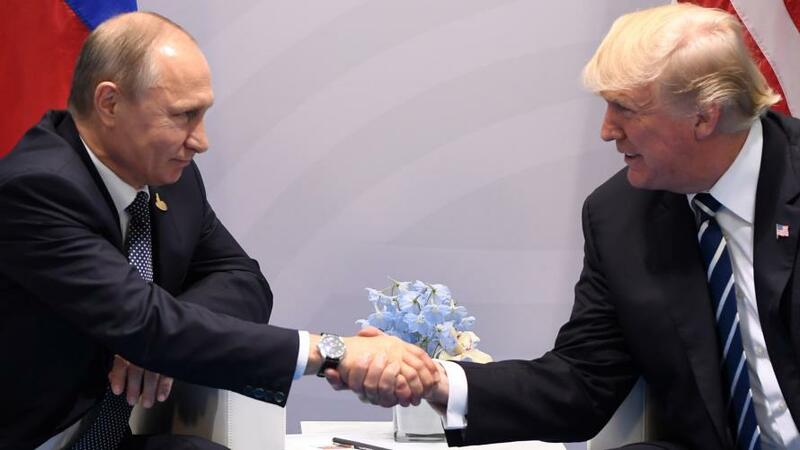 Ultimately, everything depends on whatever deal Trump puts on the table and whether he can convince President Putin that his newfound truce with the neoconservatives translates into being able to get the “deep state” to abide by the terms of any prospective agreement. If Russia is swayed by the carrot-and-stick combination of the Trump Administration’s possibly sincere commitment to a “New Détente” in exchange for an alleviation of multisided and sometimes humiliating pressure against it, then the geopolitical implications would be profound since Moscow would be ascending into the perfect position for “balancing” Eurasian affairs. It wouldn’t just have China’s tacit support for this initiative but America’s too because each superpower would appreciate Moscow becoming a “balancing” force vis-à-vis the other and freeing them up to focus on their rival in other areas of concern, mostly in Africa. As such, Russia could count on being courted by both of them and finally fulfilling its grand strategic goal to “balance” Eurasia, though provided that this speculative deal goes through in the first place and is actually respected by the US afterwards.